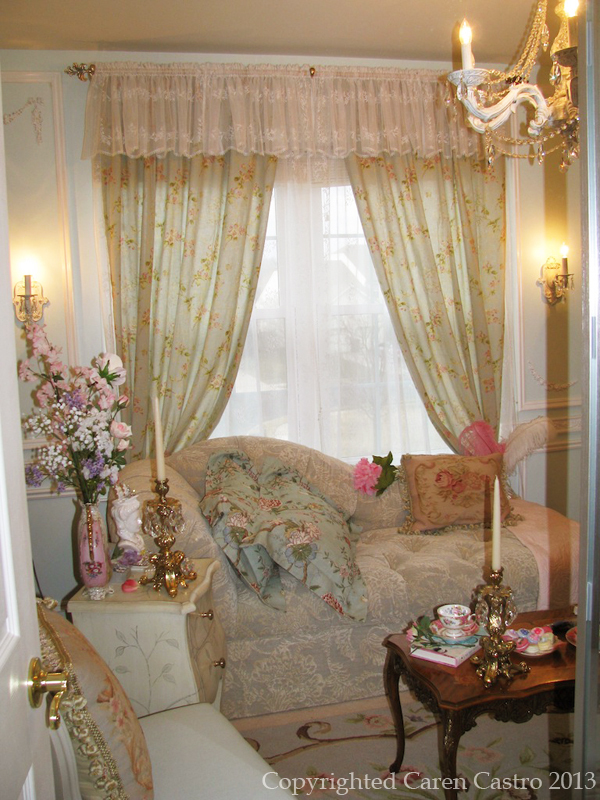 Marie Antoinette Room - Completed! Dollhouse Miniature Tools - My favourite ruler! Finally! I had some time to explore making these breakfast earrings. I love eating toast and it was just a matter of time I make some. I can eat them almost everyday. Breakfast or dinner. I like mine with butter on the top, especially when it's just out from the toaster, as you can see the butter melting slowly. I made a pair of these toast earrings featuring a melted butter toast, and a chocolate spread toast! Available in my shop under Food Jewelry. Starting this week, I'll try to participate in a blog linky party hosted by a few ladies, one of them is Jenna from Rain On A Tin Roof. Actually I don't even know if I can keep up with this, but I'll try. Every week on a monday, we're to blog about what we did in the past week, or any crafting progress, tips or just about anything! So I'll try. So, remember the fruit tart I did - and the mint leaves were missing? I finally finished it - not only did I attached mint leaves to it, I also made a P logo for it. I had a charlotte cake sitting in my pile of to-do and inspired by the mixed fruits presentation, I used the charlotte cake and decorated it as well. Yippee! But I will have to find a day to photograph it. But back to this fruit tart. I placed it in several of my half done pieces, and I finally found a home for it, where it will be permanently placed. I'm so happy for it, as well as for the entire piece. Good news! 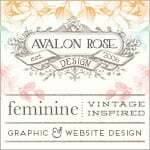 I'm running a spring sale for my Etsy shop. Minimum purchase is $20 and sale will be on till 31 March 2013. Have a great spring everyone!! It's been a while since I last made some fruit tart. 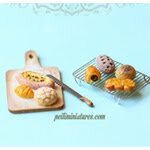 Using air dry clay, I revisited and changed my method of making this delish miniature food. I'm really pleased with my research and experiment to perfect a crusty looking tart base. That was my focus in this small project. While the sun was still strong and nice, I took a shot quickly to document it. It's not the most perfect photo but I was just too excited to capture this. Pardon my mountain of clay items in the background. I haven't decided where I should feature this in, I've 2 pieces of project (half finished) which I can place this in, but I will take my time to decide where it belongs to. But I'm pleased that inch by inch, I'm moving along, even if it is ever so slowly, to make some progress on my half finished projects. This fruit tart still isn't completed yet. Here are some mint leaves that I left aside to dry. Or maybe I will wait till the mint leaves are attached to the tart, with a logo. 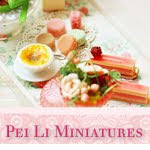 I've just added another miniature class to my offerings of craft classes. Although I had prepared this for a while now, but I've only just recently add this to my list. Recently, one of my students have completed this workshop - Macaron Pops! She wanted to try her hand at making these, but wanted a short craft class to begin with, so this was most suitable. This can be completed within 1 session, perfect for beginners. Made with air dry clay, and in 1:12 dollhouse miniature scale. 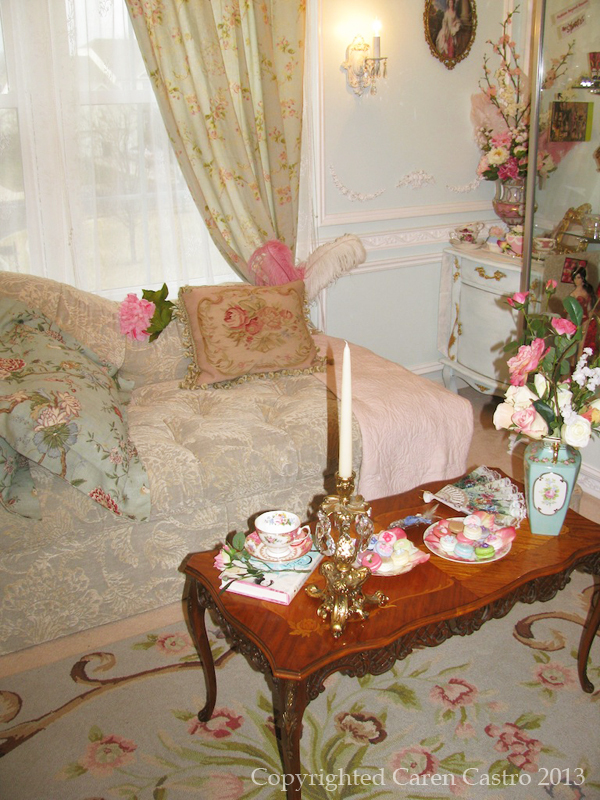 I'm pleased to be able to share these marie antoinette room photos with all of you here. My friend Caren has completed the final touches of her room and took some photos. Previously Caren has ordered fabrics to be made into curtains for this room, and has taken time to pick some pretty chinaware to display the fake macarons that I made for her. As strange as it sounds, my one and only desire before the Chinese New Year arrived was that I want to devote more of my time for volunteering during this year. I started volunteering sporadically a few years ago, when my friend and a few of her friends gathered together to do something for the old folks living in rented apartments in Chinatown. We were not part of any organization, it was just group of friends who came together to do this. This activity meant a lot to me personally because my grand aunt lived there (she has since passed away) - but I have not started doing any volunteering work then when she was still alive. I remembered that she would receive food rations regularly from organizations as well as groups of volunteers (like what my friends and I did). Sometimes, organizations would also take them out for meals like dim sum on weekends. I guess I wanted to do my part to give back to the society as my grand aunt is one of the lucky recipients who was being well taken care of when she lived there. My friends and I did this about 3 times a year, but it fizzled out when the organizers got busy with other priorities. But that was a good starting point. I was still looking out for good causes that I feel passionate about to volunteer and again last year, when a friend introduced me to an organization that packs food rations for needy families. I’ve since taken part in that regularly. As an added bonus, I also treat it as a good workout, since it is very hands-on and manual. It is fun too, to be part of a large group coming together to do something to help others. It came into my mind that the older I get, the time I have while being on the earth gets shorter. And I don’t mean that in a depressing way, as it helps me to clarify what is truly important and meaningful. This is turn, has made me think about how much time I spend doing activities that really matter to me on the deepest of levels. I’m committed into carving out some time from my life to do something meaningful, to help others in small tiny steps. I feel lucky to be able to give. Next week, I will take part in a "trial" volunteering session for something that may potentially be on-going for a long term basis. I'm still not sure exactly what I will be doing - but deep in my heart I am excited as the work done in the organization is something I believe in strongly. I filled up an application before Chinese New Year, and when I didn't hear back, I wrote in again, expressing my desire. When I received an email saying they needed a volunteer, I was thrilled because I know it will be for a good cause and my time there will be of a good use. Sometimes people want to volunteer, but they don't know where/how to start or where to go to. Perhaps many people were like me, trying to find something that they feel passionate about. It took me a while to find something that I feel strongly about. I feel lucky that I can put some of my skills into good use. If you are still looking, don't give up - keep searching for something that excites you and that you feel strongly for. Meanwhile, I am looking forward to this wonderful opportunity and journey. One of the most important dollhouse miniature tools that I can't live without is the ruler. I use it for almost everything. I've also tried everything from plastic, to metal and acrylic ones :) Tried different lengths too, but I prefer mine short. 15cm ones are good enough for me. Nothing longer than that. When it comes to types, the acrylic ones are my favourite - they are sturdy, transparent (which means you are able to see through it), smooth enough that you can even use it on your clay and it doesn't stick. How much more awesome is that? At the same time, I must tell you that I've ruined many rulers in my early days, when I was still learning to control it while cutting. When you apply too much force and pressure while cutting, sometimes it inevitably cuts into the acrylic ruler and it creates a little dent. Overtime, you get a slightly "crooked" ruler, which may be one of the reasons why you can never get a clean straight cut. When my students work on a piece that requires wood work, I'm always observing and looking at how they hold their pen knife and ruler. There is a moral obligation on my part to impart the right techniques when they are doing wood work - so that they form the right habits and practice it right from the start, as this prevents accidents/mishaps. I'm actually very serious about this when teaching wood work. So when I saw this ruler in the shop, I felt it was the answer to my earlier problem.....because they have embedded a metal rod in the ruler. This means, you'll never get to cut into the acrylic ruler itself as the metal rod blocks it! How brilliant is that!! So now, I switch sides whenever I am ready to make a cut. I've been using this ruler for couple of weeks now and am very happy with this. It reminds me, that this post would compliment the other blog post which I've written 3 years ago, on Tips on Cutting Dollhouse Miniature Woodwork. If you have never read it, you might be interested to read it here. I received a customer request to make some dollhouse cupcakes over last week. She showed me a photo of the actual cupcakes that she wanted and I followed as closely as possible. I made extras as I know these are easily loved by many even though these are no frills cupcakes. Pink whipped cream on a plain vanilla cupcake - they look simple yet elegant. I also made a miniature cupcake recipe book to go along with this set. The pages in the recipe book are blank. 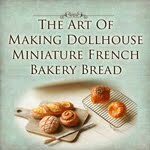 Now available as a set in my shop under Dollhouse Miniature Food section.